An enhanced-affinity trifluorinated glucocorticoid, with potent anti-inflammatory activity and low systemic exposure. Shows high concentrations of the drug with rapid onset of action. Provides excellent topical potency & low potential for systemic effects. Inhibits pro-inflammatory transcription factors and antigen -induced lung eosinophilia. Produces high receptor affinity as compare to mometasone furoate and fluticasone propionate. Improves rhinorrhea,sneezing,nasal itching & obstruction rapidly. Maintains efficacy over the full 24-hours dosing peroid with once daily administration. 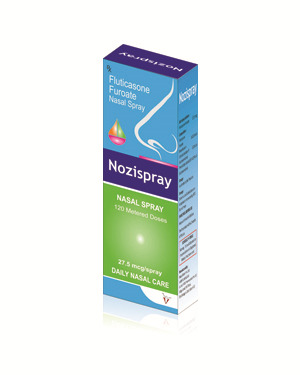 Superior over ciclesonide with respect to scent, soothing feel & less nasal irritation.